Overall Health and Well-Being – To become one of Dr. Vu’s Huntington Beach patients you need to be in good overall medical and mental health because Dr. Vu’s primary concern is your safety and well-being. If you have a pre-existing medical condition that may pose serious health risks during surgery, smoke, or if you’re on certain medications such as blood thinners you may be disqualified for surgery. 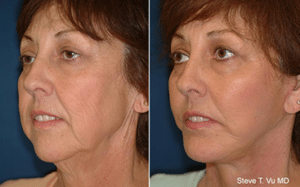 Bone Structure – A Huntington Beach patient who has a well-defined bone structure is a prime candidate. This will allow Dr. Vu to carry out meticulous facial alterations. During your initial consultation, Dr. Vu will spend an extensive amount of time studying your bone structure; it is the basic blueprint for the areas your surgery will specifically target to best suit your individual needs. Amount of Loose Skin – It’s common for surgical candidates to be unhappy because they have too much excess skin on their face which, you may be surprised to learn, is an asset for a facelift. Excess skin is trimmed during surgery and tightened during the procedure to remove wrinkles. Generally, those with a fair amount of elasticity on their face receive better results. Which doesn’t mean you need the skin of a 20-year-old. Everyone’s skin loses elasticity with age. A rhytidectomy can’t halt the aging process, nor can entirely change your appearance. In addition, these results can’t be obtained from noninvasive rejuvenation treatments. The only way to achieve the amazing results that a facelift can provide is to consult with Dr. Vu. before you decide whether or not to move forward with the procedure. You’ll have plenty of time to ask questions and look at Dr. Vu’s before and after galleries, which showcase his artistic skills. He prides himself on producing outstanding results for his patient’s in Huntington Beach. You can be assured you will never appear “windblown” or unnatural. Instead, Dr. Vu uses his extensive anatomical knowledge to accentuate your natural beauty. Typically, a facelift will make you appear about 10 years younger than you currently are. Your facelift might be the first surgery you’ve ever had performed. If that’s the case, we understand you may have a lot of questions about what your surgery day will entail. Don’t worry. We’re here to help educate and inform you about the entire process so you can rest assured you have all the necessary knowledge to move forward. Rhytidectomies can either be performed in a hospital setting or a surgeon’s office. You’ll need to fast for 12 hours before your procedure because of the strong medication you’ll be given to put you to sleep during your facelift surgery. While general anesthesia is also used, most Huntington Beach patients are given a sedative along with local anesthesia. This allows them to stay awake while the procedure is being performed and feel no pain at the same time. Each face has its own unique shape and contour. The procedure will be carried out while keeping these factors in mind. Before the procedure begins, Dr. Vu will evaluate the elasticity of the patient’s skin. During the procedure, the incision is made along the patient’s hairline from the temple to the earlobe. A small incision might also be made under the chin if the procedure involves tightening the skin around the neck. Next, Dr. Vu starts separating the skin from the muscle and the fat below it. Excess fat or skin is then trimmed to give the face a sleeker look. He then tightens a layer under the skin called superficial musculoaponeurotic system (SMAS) and folds it before pulling it back over itself. This lifts the cheeks, firms the neck and defined the jaw. Any excess skin is removed by a laser or a knife. Dr. Vu closes the incision with sutures, tissue glue or stitches. The hairline hides the stitches and covers the scar. Mini Facelift – As the name implies, this procedure works on a smaller portion of the face as compared to a traditional rhytidectomy. This also makes a mini facelift a less invasive procedure. Also known as a weekend facelift, this procedure is basically meant to improve the appearance of loose skin in the neck and the jowls. The whole procedure takes at least two hours. During the procedure, the lower part of a patient’s face is numbed by anesthesia. An S-shaped incision is made from the sideburn, around the ear and towards the bottom of the hairline. After that, the excess skin is removed along with connective tissue before the incision is closed. Mid Facelift – During a mid facelift, the surgeon starts by making tiny incisions inside the patient’s mouth and above the ear. This procedure is often performed by an endoscope which is a small camera that is used to help surgeons see the surgical area. The fat pads in the cheeks are pulled up in order to tighten sagging skin. S-Lift – This procedure is carried out on the lower third area of the face and is meant to smooth the jowls as well as the neck. The procedure starts with local anesthesia that is injected near the patient’s ear. The surgeon then makes an S-shaped incision and separates the skin from the tissue. The tissue and muscles beneath are tightened after the skin is lifted. Since an S-Lift takes less time and involves a smaller incision, Huntington Beach patients tend to recover faster. Whether you feel you’re aging too fast, or are unhappy with how you look, California Aesthetic Center’s Dr. Vu can make you to look and feel years younger and more confident than you’ve felt in decades. So, why wouldn’t you consider plastic surgery to boost your self-esteem while making you look and feel wonderful? Call our office in Huntington Beach at (714) 848-1133 to schedule a consultation with Dr. Vu and learn more about what facelift can do for you.